Assume you’re writing for a well-educated, savvy reader, who is already in the last stages of researching about the topic. I never thought I’d reach a point in which the sentence above would make my life much easier. But as soon as I read that in an email from my client, I let out a big sigh of relief. I knew who would read my article, and that made the job of writing it much easier. As freelance writers for hire, we’re often asked to write for an audience other than our own. It is an audience that we don’t know very well, that we often don’t interact with, and that usually doesn’t reply back. Often, we’re just given an assignment and left to our own (writing) devices. This may be the preferred working method for newly-minted freelance writers. But the deeper you get into the profession, and the more serious you are about it, the more you’ll appreciate when your client shares with you thorough information about the persona they’re marketing to. If you’ve ever set foot in a Marketing 101 class, you probably remember the word persona. A persona is a fictional character that is embodies the person most likely to buy your product. When you think of your user persona, you can think of the typical reader of your website, the buyer of a product you’re selling or subscriber to your services. Personas is a buzz word now because, with the rise of content marketing and the ease to access analytics, it’s becoming much easier to determine who your ideal user is. Having a persona in mind when you’re creating something meant to be consumed by an audience is an essential first step in targeting the right niche. Let’s say you were contracted to write two blog posts a month for a website that sells educational music that teaches children basic vocabulary in a foreign language. A CD costs $20 and comes with extended curricular and customer service support. In this case, the persona you’re trying to reach and engage with your blog posts is probably Isabelle. Isabelle is a fictitious character. She is also the mother of a seven-year-old, and she’s very involved in her child’s education. She is middle-class, college-educated, likes to travel and speaks at least a foreign language herself. Isabelle does not mind spending a little bit extra for her child’s education, as long as she gets a good experience and sees long-lasting results. Isabelle is looking for a quality product, and she’s always diligently researching the latest language learning apps for children. Why should I care about the persona? I’m just the freelance writer. I’m not the marketing department. Why should I care about the persona? Quite simply, because it will make your life much easier to know who you’re writing for. Writing with a persona in mind increases reader engagement. It also reduces the endless rounds of revisions and the constant back-and-forth with your editor. As a freelance writer, you should understand the product, the brand and the voice of the client. Writers are not mind readers, so they shouldn’t act like one. Let’s go back to Isabelle. Let’s pretend you didn’t know anything about her before writing your blog posts. So you might choose to write a post about free language learning resources. Would this be good for your client? Obviously not, because they are selling a pricey product. Would this be good for Isabelle, your reader? She would probably not even bother to read your post, because she is interested in products that offer support (most free products don’t), and she doesn’t mind paying for a good quality product (price is not a pain point for her). So knowing exactly who you’re writing for benefits you (the freelance writer), your client (the business that is selling the product) and the reader (the end user that the business hopes to attract as a client). A well-researched reader persona is really a win-win-win. 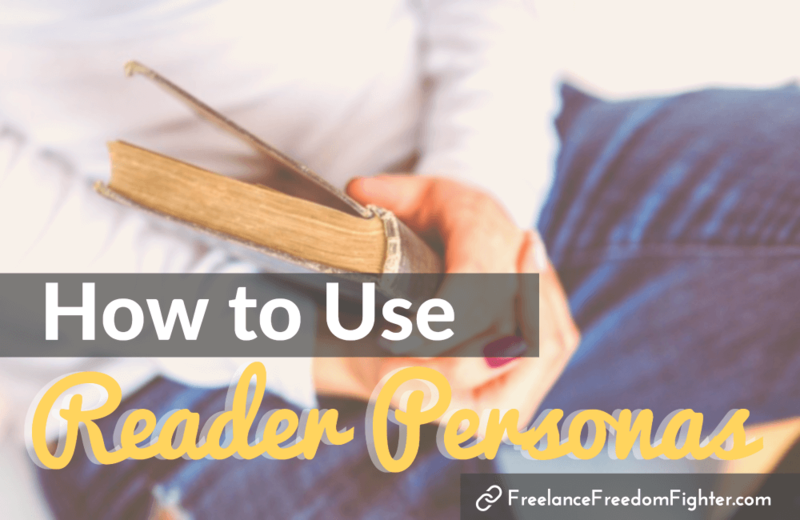 How do I find out who the reader persona is? by studying the industry and the competition. However, only one of these ways is ideal and you should always start with that. You guessed it. It’s your client that should inform you about their user persona. If you’re subcontracting for a larger company, the marketing department is usually the best source to find out about the user persona. In some online companies, the people in charge of user experience (UX) and user interaction (UI) are also really knowledgeable about who the user persona is. Maybe your client is just starting out and they don’t have a persona yet (their mistake, not yours). Even if it’s a small company, or a one-person operation, there are some questions that they should be able to answer about their end user. Asking smart questions demonstrates that you are a serious professional who is eager to grasp the details of the project. Here are some things that you can ask, and some examples of how Isabelle – the user persona we identified for the language learning company – might be targeted with you blog posts. General questions: what is the gender, age group, education level and average income level of your ideal persona? What is the intended purpose of your content: to inform, to entertain, to build community, to raise awareness, to pre-pitch, or to make a sale? What is important to your reader? Which of these problems does your product solve? What objections might your reader have regarding the content and your product? In what context will they use the website or the product? What is your reader’s purchasing decision-making process? Do they care more about price or about quality? Are they topic savvy or will they need support? Do they care about brand or practical value? Are they interested in joining a community or are they independent? If your client already has an active page, it’s a good idea to take some time and research their website copy and what they previously published on their blog. What information is on the About page? Who is on their team? What are their roles? How is the team presented? What other blog posts has the client published? What is their tone? Are they serious and professional? Are they whimsical? Are they humorous? Are they trying to be hip or formal? Is the style authoritative or conversational? You shouldn’t parrot your client’s other content, but you should use it to better understand their style, tone, and voice. Observation is important. I would go further and say that for a freelance writer observation is crucial. The content that your client creates is being consumed by their audience. What is the reaction of this audience? Who is leaving comments on your client’s website? Who is interacting with your client’s social media accounts? What objections are they raising? What is their voice and their tone? Are they angry and dissatisfied? Are they grateful for the information? Are they confused? Are they asking more follow up questions or are they usually in agreement with what’s stated? This is not something I would recommend, because it’s usually hit or miss. But if your client fails to deliver the information on time, and “stalking” through the client’s archives and comment section is not yielding any results, you may use the industry standard or the competition. Hubspot has an excellent resource about user personas in different industries. (http://academy.hubspot.com/examples?Tag=Buyer%20Persona). But use it carefully and only as a very last resort. Personas vary a lot even in the same industry, and even when very similar products are compared. Remember, ask your client first who their user is. When in doubt, always ask the client. In the end, remember that you can’t write for everybody. Investing some time upfront to become familiar with your audience will lead to more engaged readers, more conversions for your client and repeat business for you. Have you ever written with a persona in mind? 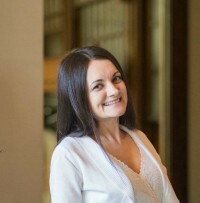 Mickey is a freelance writer with a background in training and language teaching. She works with companies in the language learning sphere to help them clarify their message, create valuable content and attract loyal users. Mickey geeks out about language, EduTech and motivating adults to study a foreign language on her blog at Panglossity. If you’re serious about learning a foreign language, check out Mickey’s free micro-course 15 Strategies to Learn a Foreign Language for Swedish startup Daily Bits Of. Mickey! Love this post! So informative. I picked up a client in the app industry and they had no clue who their persona was for their product. And I am their blog writer, so I just made one up myself (based on the product) and lo and behold, it IS their persona (college kids to young adults who are mobile savvy and enjoy entertainment). Great tips! Will bookmark for sure. That’s brilliant, Elna! Although it’s rather disconcerting that they, as a creator of a product, didn’t know who their product was for.